Wearing High cut Bustier from Asto Group, Asymmetric Skirt from Finders Keepers, Navy blazer from Finders Keepers, finger silver rings in wishbone, infinity loop and star from Eclecticism. For Day 2 of AFF, I paired this high cut top that fits me like a glove from Asto Group, together with this asymmetric skirt. I particularly like that the skirt is simple yet statement-making, thanks to its geometric prints and asymmetric hemline. This whole look is very pulled together, allowing me to go through a day full of business talks and professional interviews at the Asia Fashion Summit 2014, and then for the shows afterwards at night. 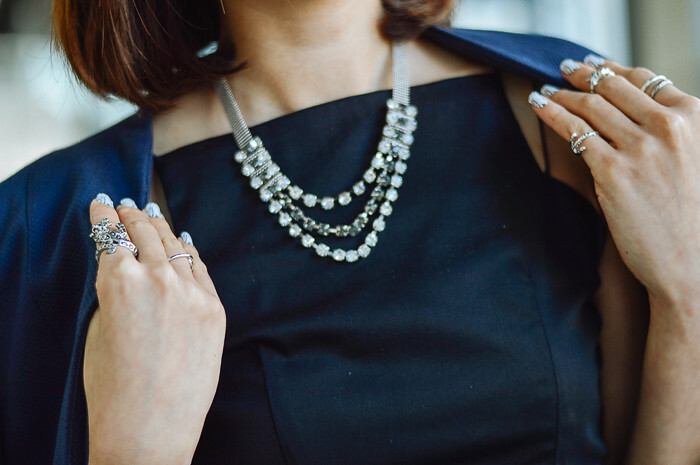 Fingers were dressed up with these delicate silver rings from Eclecticism, which is designed and produced locally. These finger rings come in thoughtful designs like the wishbone - the one that I'm wearing on my pinky finger, as well as infinity loop, geometric shapes and spiked. Best thing is the range of ring sizes available - you can actually get different sizes to fit different widths of the same finger! Style tip here - Keep primary colors to three for a aesthetically pleasing look. Color palette here - Black (which is actually a non-color), Navy and White, dressed up with silver accessories.